The shooter opened gunfire at people leaving a church service in Russia’s Dagestan region. FIVE WOMEN HAVE been shot dead in an apparent radical Islamist attack on an Orthodox church in the North Caucasus region of Dagestan, officials and local media said. 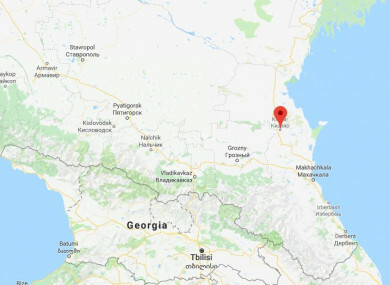 “An unknown man opened fire with a hunting rifle in Kizlyar, fatally wounding four women,” the regional internal affairs ministry said in a statement. The attacker was “eliminated” by police fire, the regional internal affairs ministry added. “We had finished the mass and were beginning to leave the church. A bearded man ran towards the church shouting ‘Allahu Akbar’ (‘God is greatest’) and killed four people,” Father Pavel told RBK. Islamist rebels from the region, which lies immediately east of Chechnya, are known to have travelled to Syria to join the Islamic State group. In 2015, IS declared it had established a “franchise” in the North Caucasus. Sunday’s shooting comes exactly one month before the March 18 presidential election that Vladimir Putin is almost guaranteed to win. Email “Five women killed and four injured after gunman opens fire on churchgoers in Russia”. Feedback on “Five women killed and four injured after gunman opens fire on churchgoers in Russia”.